It reveals how a bottle of Irish malt whisky helped to unlock a secret past that Sheila had never heard of, linking her father with key moments in Irish history. 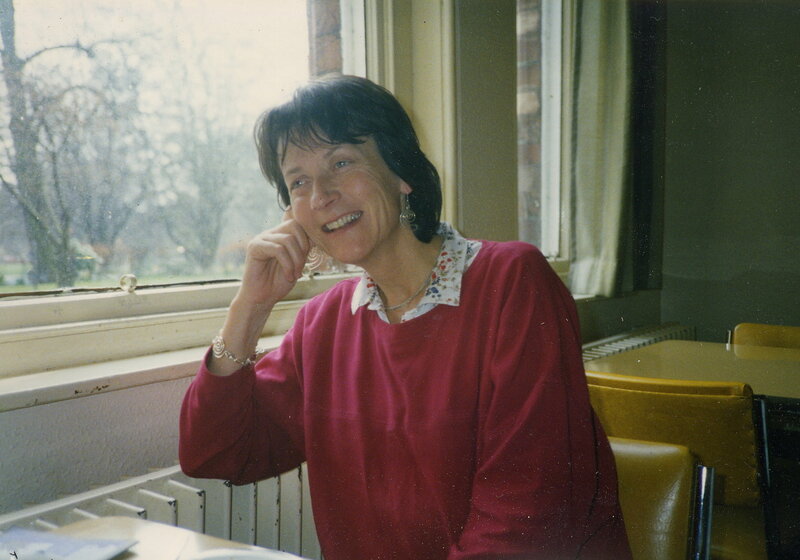 I didn’t meet the love of my life, Sheila, until I was about forty; the picture below shows the magic of her smile. By the time we married, I was nearer 50. One consequence of this was that her parents were quite elderly when I first went to stay with them. Feeling quite nervous about it, I took a bottle of Irish malt whiskey as a gift. Her father Frank (Paddy) Ryan was not a big drinker, but I wanted to acknowledge his Irish roots in a positive way. He was born in County Cork in the Irish Republic, but like many of his generation he had crossed the water to England and served with distinction in the Royal Warwickshire regiment throughout World War Two, having joined up as a regular soldier in the 1930’s. 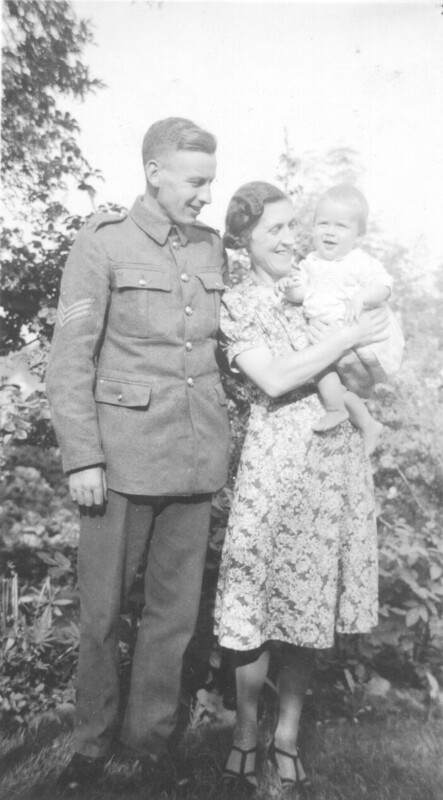 He is shown here with his wife Margaret Sparrow and their son David, in Warwick. His platoon went to France with the British Expeditionary Force in 1940 and fought as part of the rear guard at the Battle of Dunkirk, delaying the Germans while the other troops were evacuated. Sadly, an SS unit captured and murdered many of his friends in the notorious ‘Wormhoudt massacre’ after the battle. Because he was a crack shot with the rifle and mortar, he went on to spend the rest of his war training new recruits back in England, ending up as a Staff Sergeant. Later, we met someone who had been trained by him in the army. He told us that Paddy was famous in his own quiet way, simply because he was the only Sergeant in the British army who had never, ever, been known to swear at the men under his command. Sheila thought this was because he’d been very badly treated by the Christian Brothers as a boy in Ireland, and he’d vowed never to bully others. Not that Paddy suffered his own bullying in silence; he was always a ‘little soldier’. He often hid up a tree and threw stones down at the Brothers as they walked past below, and on one occasion he dragged the Brothers’ donkey up the spiral stairs into the church bell tower. When the bells rang the donkey panicked, brayed loudly for hours, and refused to descend. His relatives feared for his future, thinking he would become a ‘bad lad’, and were much relieved when he joined the army. In fact he was a gentle, self-effacing man in civilian life, adored by Sheila and her siblings, by his wife ‘Molly’, and by his grandchildren. 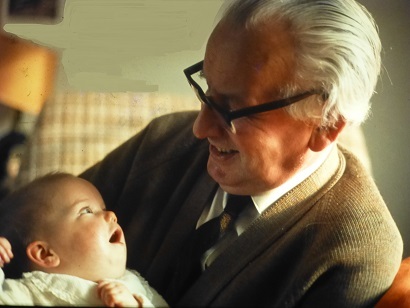 Here he is holding Catherine, one of his grandchildren After the war he became a skilled tool-setter at Lockheed and was rapidly elected as the shop steward. Despite this role (and his exemplary war service) when the Birmingham pub bombings occurred he was ‘sent to Coventry’ by his work-mates, simply for being Irish. Sheila was a little sceptical about these stories, having never heard either before. But Paddy did not generally make up stories or tell untruths; far from it, he had a reputation for scrupulous honesty. However, he was 85 at the time and we suspected that he had a brain tumour (later confirmed). As a doctor, she thought he might be mixing his army and childhood memories up. We discovered a fascinating tale of struggle and resilience in the face of enormous difficulty; yet also a tale that was probably typical of that generation who were children during the struggle for independence. Many were forced to emigrate to find work; independence was followed by a disastrous civil war, a trade war with Britain, and then a world-wide depression. 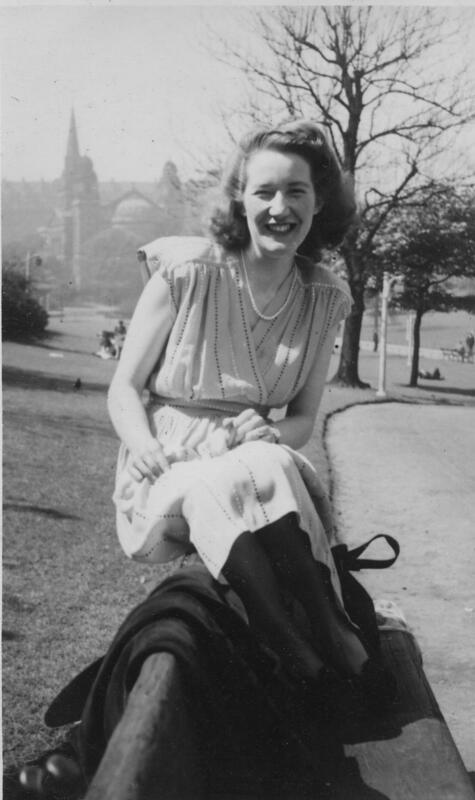 My own mother, shown here in 1946, met another County Cork man, a handsome merchant navy engineer on the Atlantic convoys, while serving beer in her father’s pub. Those convoys were Britain’s lifeline during world war two; the merchant navy literally kept Britain alive. Pat had sung at the New York Metropolitan opera house (and had the publicity photos to prove it). He was also twice sunk by U-boats, and survived each time. Perhaps he had secrets, too. With his talent, why hadn’t he settled in America? Why traverse the globe, fixing engines on tramp steamers? All her life, my mother kept her face powder in a small wooden bowl with a mirror in the lid. 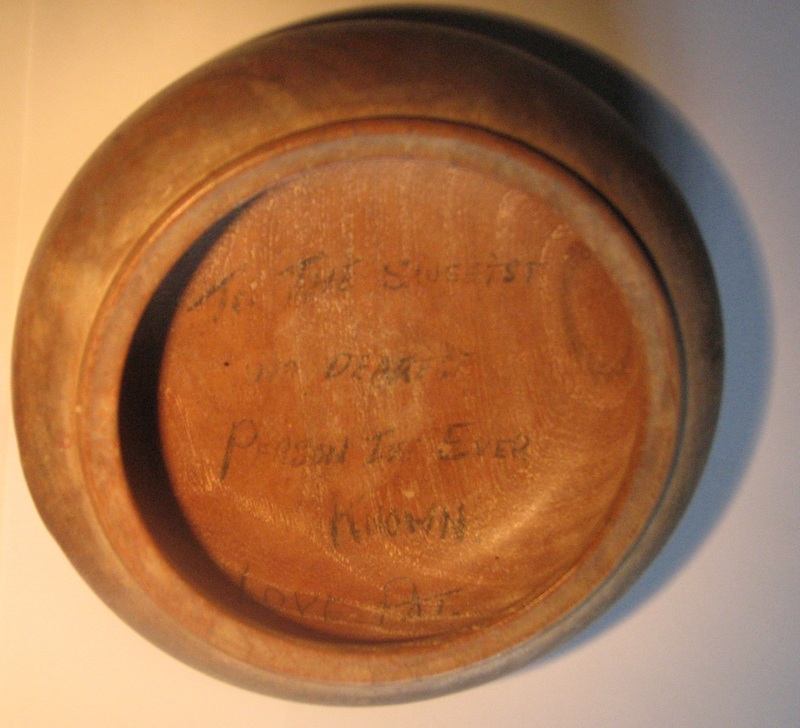 After her death we discovered that carved inside this bowl, under the powder, was the inscription, “To the sweetest and dearest person I’ve ever known, love, Pat”. She had never forgotten him. Meanwhile my father spent his war years in north-west India (now Pakistan, near the Afghan border) where he found himself bridging two worlds – that of the old-fashioned Raj and the new India-to-be. Called up as a newly qualified maths teacher, the army put him in the Royal Signals and sent him overseas to train soldiers in signalling techniques. 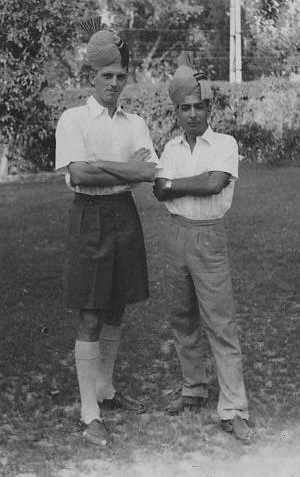 In Peshawar, he developed a close friendship with an Indian signals officer (Captain Ananda Mehra, known as ‘Andy’) with whom he worked – see the picture of the them together, in fancy dress. When he returned from a visit to the Mehra family home, he also found himself ‘sent to Coventry’ by the other British officers and soldiers. I’m proud to say this did not deter their friendship or inhibit my father’s love of curries from the bazaar. The army solved the problem by letting him work mostly with Indian and Gurkha regiments. He amassed a wonderful archive of black and white photographs; the examples shown here are a small sample from his collection. 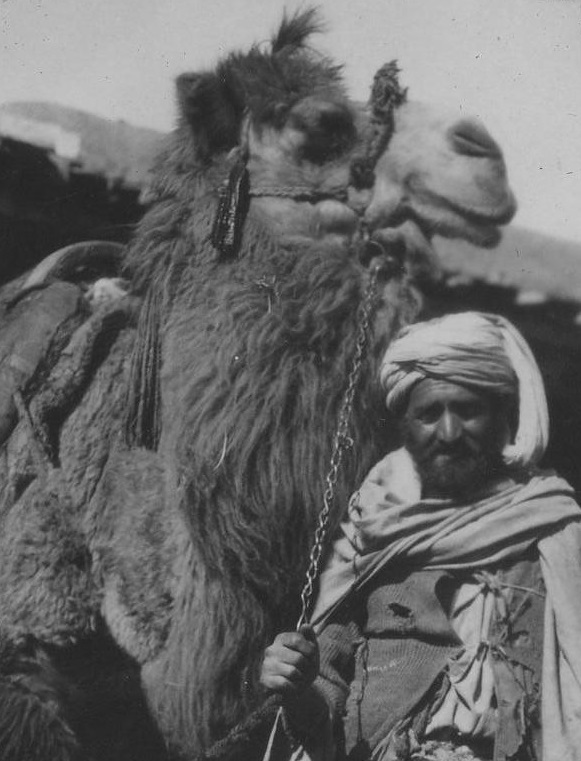 The camel trader shown below was taken in 1944 when he acquired some Persian and Afghan carpets from merchants coming over the Khyber pass. He packed the carpets up in a trunk and sent them home, part of a consignment due to travel on a certain ship. Unfortunately, he soon heard that this particular ship had been sunk by a Japanese submarine! He didn’t buy any more carpets after that. But much to his surprise, after he’d been home 18 months the trunk and the carpets turned up, undamaged… better late, than never! 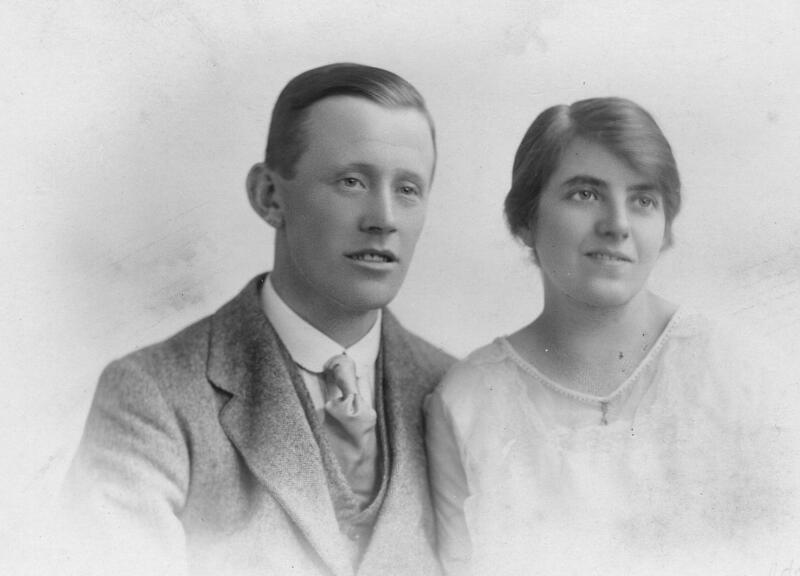 Like many overseas soldiers, he received a dreaded ‘Dear John’ letter breaking off an engagement to a girl back home. 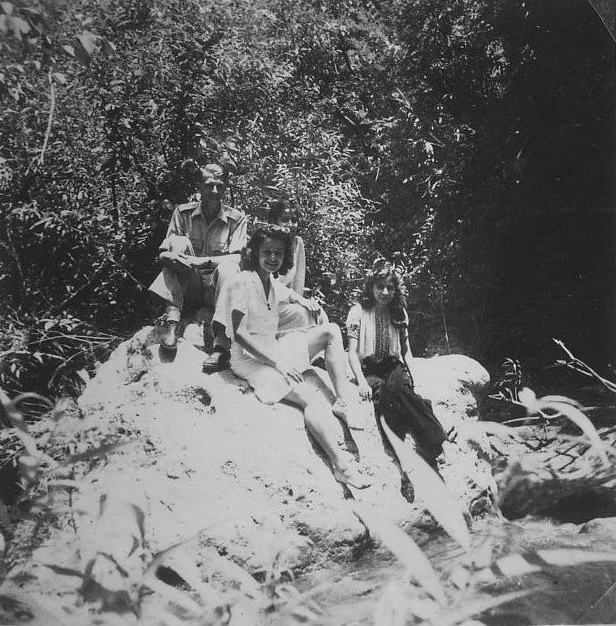 But he rapidly learned to enjoy being a bachelor in India, as his photo archive proves…there a number of photos of him with various pretty girls, such as this one with a very attractive Anglo-Indian girl and her sister, by a waterfall in Kashmir. While there, he took the picture below titled ‘urchins in Kashmir’. Some of his photos also show a darker side to his experiences; the bodies of tribesmen killed by their own (tribal justice) or by the British when they attempted to raid the army bases for weapons. There were regular ‘tea parties’ with the Pathan chiefs in order to smooth out these incidents. After the war, he became a respected headmaster at a northeast comprehensive school; few people knew about his secret life in India during the war. On the home front, my mother’s father was a different kind of hero – a man who not only stayed loyal to a wife whose mental health went gradually but very, very steeply downhill, but somehow managed to raise their six daughters almost single-handed. The picture shows them on their wedding day. He ran several small businesses (including the pub) throughout the thirties and forties in a remote corner of the northern dales. Those daughters grew up to become loving and generous aunts to my generation, but the stigma of mental illness left a veil of secrecy over their childhood; added to by darker secrets when one of the sisters died in mysterious circumstances, just after the war.